อย่างไรก็ตาม หัวใจของเราในคืนนี้อยู่ที่ประชาชนบริสุทธิ์ที่ต้องสูญเสียชีวิตและสวัสดิภาพไป เราส่งใจและเสียงสวดมนต์ไปยังท่านเหล่านี้ทุกๆ ท่าน ขอให้ท่านไปสู่สัมปรายภพเทอญ. It is utterly unspeakable for me to see the ghastly images of several murdered and injured people in Bangkok tonight. My condolences go directly to the lost ones, the injured ones, and all loved ones of theirs. We demand a rapid and most efficient investigation to go to the bottom of this barbaric act, and we will do whatever we can to assist such an effort. 1. Who in Thailand has in possession of such a weapon of mass destruction? 2. The Erawan Shrine was exactly where a mentally-disturbed man was hired to destroy the Bramaric Statue during the elected government of Dr. Thaksin Shinawatra. Since the Thai Police Spokesperson just announced that the bomb was tied to a pillar of the shrine, one has to wonder if people in charge of the same shrine are involved with this incident. 3. This situation may delay the resumption of Thai democracy. Who benefits from such a delay? Date: 10 December 2014, New York. The Organization of FreeThai for Human Rights and Democracy (FTHD) was established to monitor the nominally civilian government installed and led by the Thai military junta leader, General Paryuth Chan-ocha. The Organization found that the Junta Government has not only exhibited any political will to bring Thailand back on its democratic since the coup d’état of 22 May 2014, the Junta has also further limited the rights and freedom of the Thai people. The followings concrete measures underlie the circumstances on what the Junta has attempted to do so in the past six months. 1. The Regional Administrative Organization of Thailand, which is considered one of the footholds of Thailand’s democratic milestone, was repealed by the Junta. All local elections are suspended indefinitely, and all contested seats will be retained by those who have been in position without any new election. 3. The Junta declared that the appointed National Reconciliation Assembly will also draft a new constitution. The junta has claims that this constitution will be a “true” democratic constitution. Yet, in reality, the Drafting Committee only consists of Junta-handpicked individuals who will represent the Junta’s interest. The Junta also announced that there will be neither public hearings, both official and unofficial, nor a referendum. Furthermore, the Drafting Committee has also proposed the appointment of non-elected “Supreme Ministry” to be the governing body over elected branches of government including the executive and legislature. 4. The Junta had once announced a roadmap to roll out a new constitution that would allow a new election in 2015. However, this is no longer a case as the junta has recently stated that the next election should not be expected until 2016 without any exact timeframe. Meanwhile, the martial law still remains in place. 5. Thailand under the Junta administration in the past six months has experienced a decadence of justice. The rules of law were bent to serve the will and vested interest of the Junta rather than to serve for justice. The Junta and, particularly, its leader—General Prayuth Chan-Ocha have abused their power through the use of the martial law and additionally unlimited power given by the provisional constitution. Many civilians and students have been detained just because they expressed their disapproval to the Junta. In much more depressing issues, many of them have been charged with lèse-majesté and have gone on trial in the court-martial, which does not give the defendants the right to appeal. 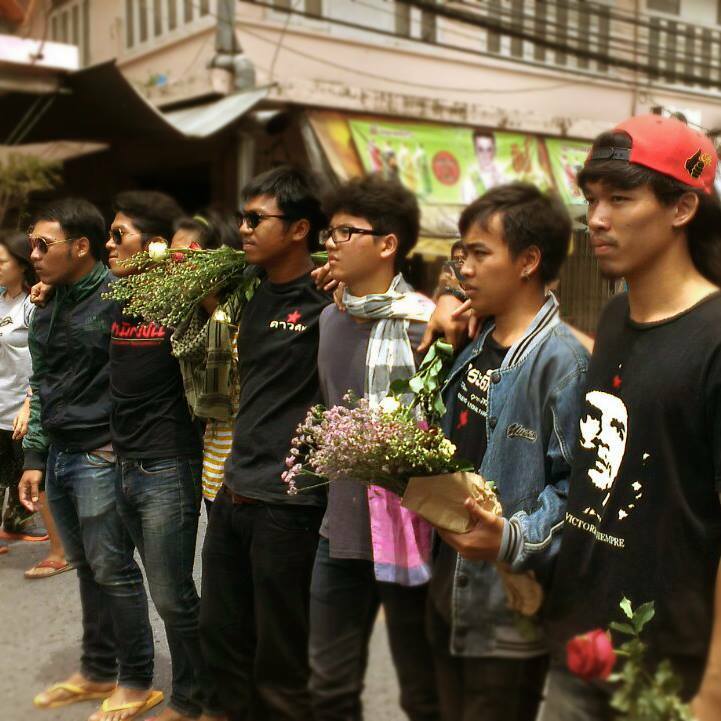 A recent abuse of lèse-majesté law can be seen in the use of the law as a purge against a group of policemen. Also, this law has been used to silence the media that are deemed to threaten the political legitimacy and stability of the Junta as well. The court-martial, for example, sentenced the editor of the Thai E-News website to nearly five years in prison for lèse-majesté act. It is my honor to inform you about this real current situation in Thailand for your decision that might be made regarding Thailand and Southeast Asia region during this time of turmoil. 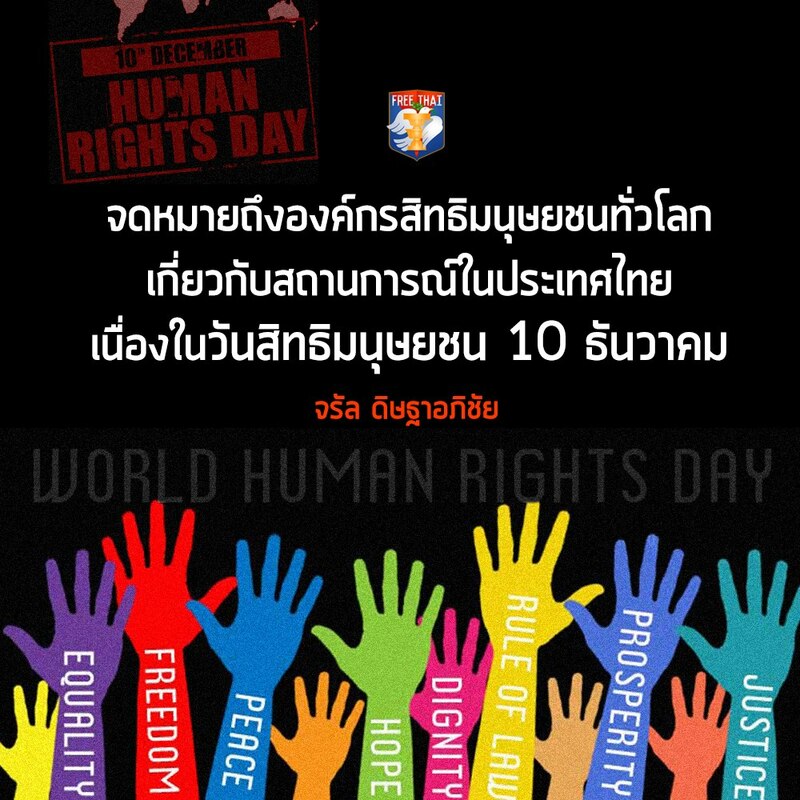 December 10th 2014 is International Human Rights’ Day and I, Jaran Ditapichai, coordinator of the Organization of Free Thais for Human Rights and Democracy (FT-DH) and former National Human Rights Commissioner of Thailandwould like to informmy friends and colleague about the continued human rights violations carried by the military junta since their coup d’etat of May 22nd 2014. As all of you might know the coup d’etat staged by the National Council for Peace and Order (NCPO) was the 12th successful coup in Thailand.The NCPO seized power from the people and from the elected government of Ms. Yingluck Shinawatra. It dissolved the democratically elected parliament, declared martial law, forbid freedom of the press and freedom of expression, and curtailed the right of peaceful assembly. The NCPO rapidly established full-blown military dictatorship. It then started issuing dictatorial decrees, followed by the establishing an interim constitution that granted them full authority and which limited people’s freedom and rights. It then appointed the National Legislative Assembly, where over half the members were military officers and appointed the government. Gen Prayuth Chan-ocha, the head of NCPO, became Prime Minister, and key members of the coup makers became ministers of important departments. 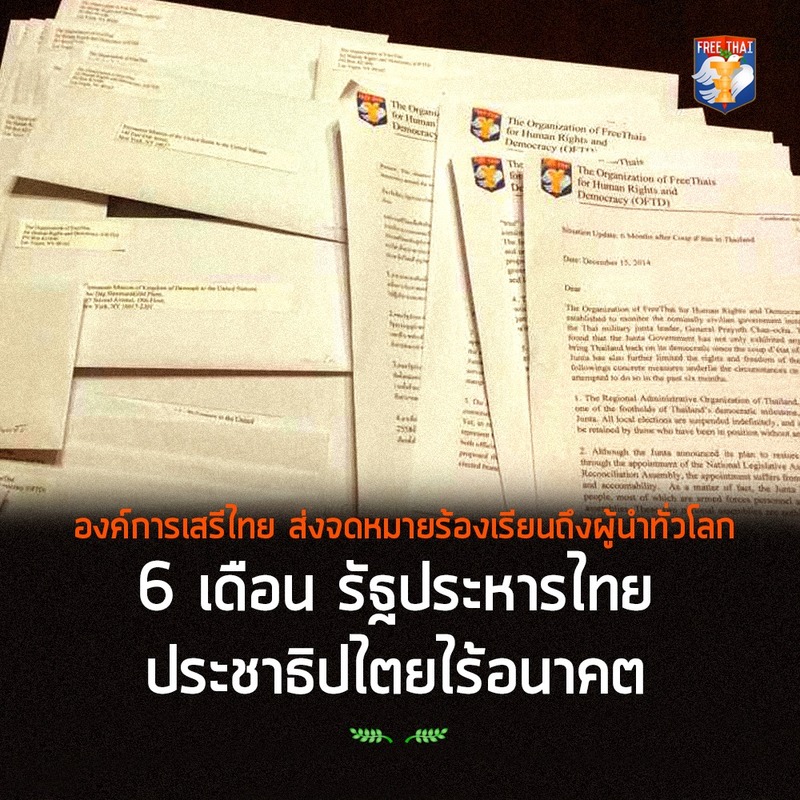 The NCPO the established the so-called National Reform Council to deceive the Thai people. 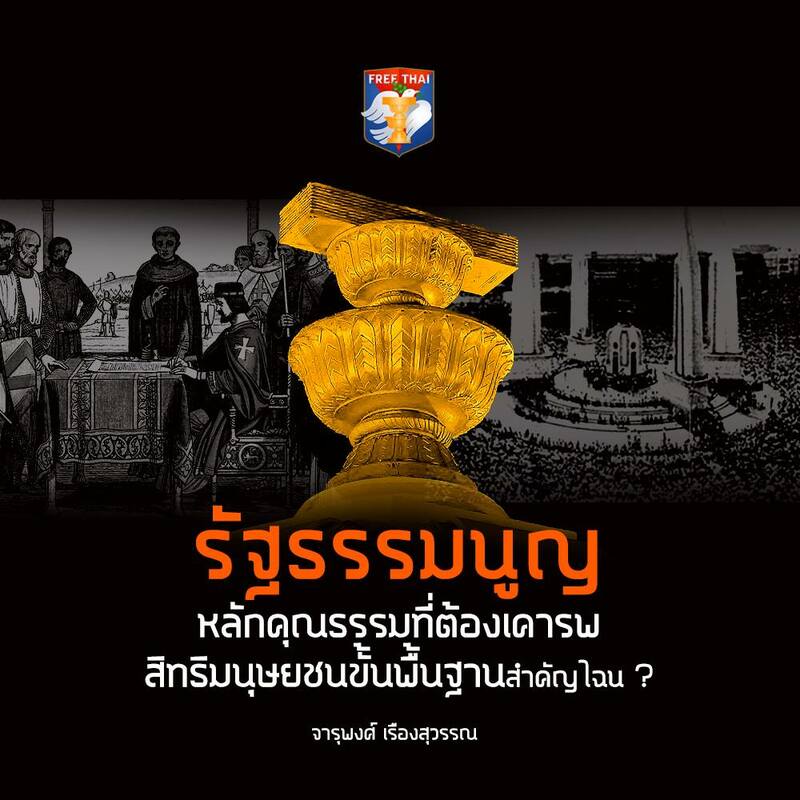 The last mechanism put in place by military junta is the constitutionaldrafting committee which is composed of royalists and conservatives who have continually showed their antipathy towards democratic norms in the past. During the first 3 months of the junta they violated human rights of Thai citizens, with551 people summoned by the military without any charge. Out of that number, 242 were detained, 77 were arrested, 14 were tortured, and more than 60 were charged and now have to appear in the military court. Some have disappeared and are now presumed dead. [Until now the junta arrested 301 persons .229 are still in detentions .69 were sent to the military court.] << These numbers are very confusing as you’ve not expressed the exact time frame. I want to draw attention to the fact that the ultimate aim of the junta is to protect the monarch. The draconian lesemajeste law – article 112 – is being daily used to suppress any discussion of the monarchy. As of today, there are 19 cases pending in the military court, including a charge levelled against myself, and the military authorities have declared they may seek to prosecute 10,000 more violations of the 112 law. The NCPO does not only use the martial law to rule the country but it also adopts a strategy of fear, using tactics designed to inculcate fear amongst the general population . Often military units are deployed in convoys to specific targeted villages inthe North and Northeastregions where there are strong bases of the red shirt pro-democracy movement. Local military commanders have prevented students, academics and NGO’s activists from holding even no-political seminars & debates and “summoned” those who still tried to continue with their activities. Last month,16students who used the 3 finger salute from the Hunger Game’s film as a symbol of resistance to the junta were immediately taken away a police stations with solders searching the students who distributed leaflets. The military government of General Prayut Chan-Ocha does not respect the UN orInternational Conventions and Covenants to which Thailand is a party. These include the Universal Declaration of Human Rights (UDHR),theInternational Covenant on Civil and Political Rights (ICCPR) and the Convention against Torture and Other Cruel, Inhuman or Degrading Treatment or Punishment. The state run human rights organisations – and especially the National Human Rights Commission- do not play any role to protectthe human rights of Thais.However, international organisations such as the EU, theOffice of the High Commissioner for Human Rights, Human rights Watch, the International Federation of Human Rights and Amnesty International are all monitoring the violation of human rights in Thailand. Finally, yet importantly, I would like to personally thank the various countries that did not recognize the coup, and have since applied pressure to the military government to stop violating human rights. We hope this effort continues and hope that they continue to demand the return of democracy through election to Thailand as soon as possible.